If you are looking for an addition to your home theatre that would take care of the rich and dynamic bass, then this active subwoofer is the right choice. Bass when playing music and breathtaking effects when watching movies ensures closed 16cm conical inverter with lower emissions. Built-in amplifier offers 100W continuous power with a frequency range from 33 to 700Hz. Subwoofer is ideal for integration to configuration range from 2.1 to 5.1. Its elegant design and compact dimensions complete the interior of your modern living room. For shipping to other EU countries visit this page PIONEER S-21W black. 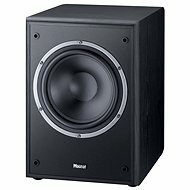 Für Versand nach Deutschland, besuchen Sie bitte Pioneer S-21W schwarz. Chcete doručit zboží do Česka? Prohlédněte si Pioneer S-21W černý. Chcete doručiť tovar na Slovensko? Prezrite si Pioneer S-21W čierny. Für Versand nach Österreich, besuchen Sie bitte Pioneer S-21W schwarz. Magyarországra történő kiszállításért tekintse meg ezt a termékoldalt: Pioneer S-21W fekete.